You are out with a large group of friends or your family, and you can't agree on a place to eat. One person wants pizza, the other wants tacos, another wants seafood, another has a hankering for fondue, and yet another wants felafel and hummus. The good news is that there is something for everybody at Foodgarden Market in Plaza Rio. From the creators of the local favorite, Foodgarden, comes Foodgarden Plaza Rio- a place where you can not only catch a bite to eat before catching a movie next door, but also buy a loaf of bread and wheel of craft cheese for the road from its market. 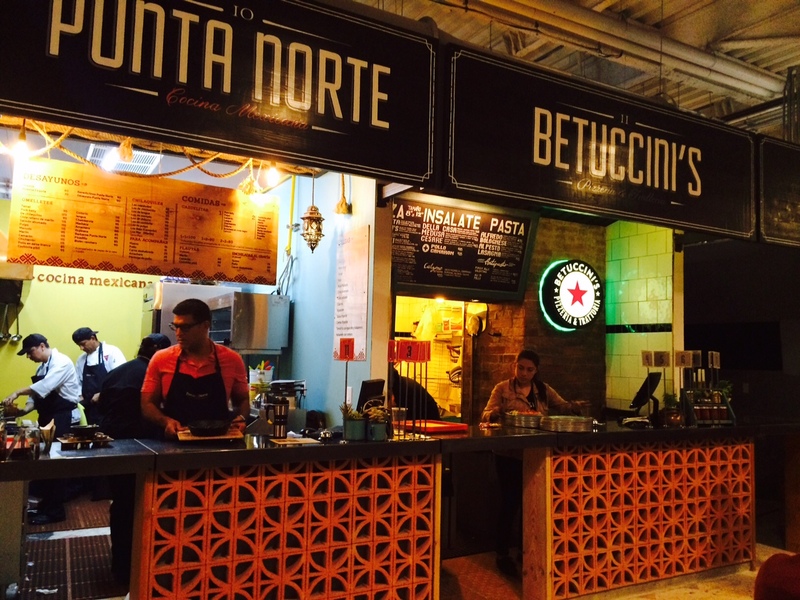 It's a gourmet food court, coffee shop, and market in one location. What makes Foodgarden Plaza Rio different than a regular mall food court is the quality of the options. You won't see franchises like Subway or Burger King here - instead it houses some first time restauranteurs such as Meraki, where I tried a tostada loaded with veggies named the "Vegetarian Vampire", and another tostada topped roasted coliflour. Foodgarden Market also hosts scaled down favorites. Rosarito favorite Betuccini's Pizzeria & Trattoria has opened up a small scale version with its most popular pizza, pasta, and salad options. Erizo, a popular seafood ceviche restaurant in Tijuana, has also opened up shop here with a paired down menu. Los Chilaquiles has branched off with a new concept called Punta Norte, where you can try their signature chilaquiles served in pretty much any type of sauce you can think of, or mix it up a little and try their other traditional Mexican food options served in small sauce pans called "cazuelitas". Chef Martin San Roman has returned to Tijuana with a stall of his own, where he is serving up his signature french cuisine. About half of the location- the "market" portion of the concept- is still under development . There, you will be able to purchase homemade bread and artisanal local cheese, as well as many other items you would expect in an urban market. There are also plans for a bar and craft beer and local wine will be par for the course. Unlike their flagship location, here you pay each shop for whatever you order. This is a great place to try out a bunch of things at once for tapas style eating, or go for a full entree. [p]For beverages, the Coldwater Bar serves up the standby aguas frescas from the original location, usually including lemon and cucumber water, lemon and lavender water, watermelon and mint water, Thai Tea, and others. They also serve coffee, beer. and soft drinks. Foodgarden Market is located in Plaza Rio, in Tijuana's Zona Rio, right behind the Cinepolis movie theater. The location is not accessible from within the mall; the entrance is directly from the parking lot. For more information, visit their Facebook page.